Folkster M. Ward surprised us all with a new album on Friday, a 35-minute, 12-track tribute to the music industry and its many colorful characters called What a Wonderful Industry. Even on this most-busy new music Friday, this lean ambush release is worth slicing out a half-hour of listening time, and you can do just that below. 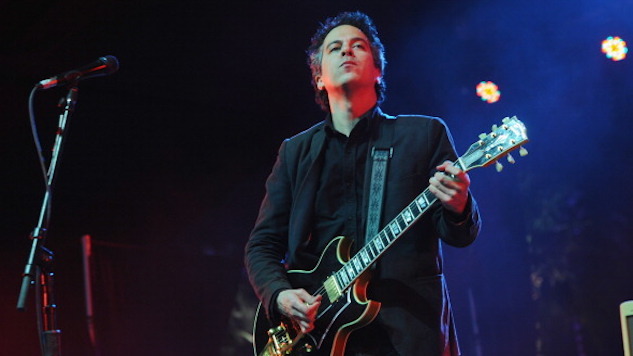 What a Wonderful Industry, M. Ward’s first solo release since 2016’s More Rain, arrives in tandem with a North American tour, which includes dates with The Decemberists, The War on Drugs and Foo Fighters, and kicked off in Philadelphia Thursday night. You can find those dates down below, too. This is a record inspired by people in the industry I have known—heroes and villains in equal measure. There’s some beautiful moments when you travel for a living, and I’m grateful for being part of an industry that’s taken me around the world so many times—but you quickly learn there’s a perfectly imperfect balance of cold-blooded and warm-blooded animals in the zoo. This record visits the most memorable characters. There’s a lot of very inspirational people I’ve had the pleasure to work with but there are also a few I wish I’d never met. It all tragically ends with an imaginary Griffin Mill-inspired murder ballad. Ward’s most recent full-length release was actually Christmas Party, a mellow collection of holiday tunes made with his She & Him partner Zooey Deschanel. The dreamy duo also released a pair of new songs, or, rather, two versions of the same new song, in April: “He Gives His Love to Me” and “She Gives Her Love to Me,” part of the Universal Love campaign which rallies for more gender-equal love songs. Now that New Girl has officially wrapped, perhaps we can even hope for more She & Him releases in the future, given that, of course, Deschanel remains one of the “warm-blooded animals” in the industry’s musical zoo. We kid, we kid, but we also wouldn’t protest a new volume of She & Him pop glories. You can hear “Miracle Man” below and stream What a Wonderful Industry in full here. When you get done listening to the new stuff, settle in for M. Ward’s 2012 Daytrotter Session and see his tour dates further down below. 08 – Quebec City, Québec @ Festival d’été de Québec !